Hi, I’m Mia Jane, the designer, creator and crafter behind Mia's Craft Ideas. I do have lots of craft ideas as I love making things, I will share my creativity with you and I hope to hear about your craft stories too. I am a single parent of 3 kids, so I understand what it’s like bringing up kids on a budget. I have supplemented my income over the years by making and selling crafts, which has helped for those extra’s that we otherwise just couldn’t afford. For many years I ran a part-time craft business whilst working full-time, it had to be fun or I wouldn’t have continued. As the sole provider for my kids I never felt comfortable leaving paid employment to concentrate on my crafts. Josie is a great addition to the team, she listens patiently to all my ideas and lets me know what she thinks. She either barks and brings me toys or falls asleep if I'm boring her. I was diagnosed as being partially deaf when I was 12 years old. I have never let my disability stop me from doing what I want to do. I taught myself how to lip-read and got on with my life. Being deaf is a part of who I am and I learned to accept it. In March 2008 I collapsed at home and ended up in hospital, the doctors think I may have had a stroke but are not sure. I found it very hard to walk properly my legs would give way for no reason. I couldn't keep my balance and felt dizzy all the time. I was suffering with severe pain in various parts of my body and I was extremely tired all the time. My skin felt like I had been severe sun burn and even my clothes hurt when I moved. I was diagnosed with fibromyalgia 6 months later and I’m now officially unemployable. Fibromyalgia is hard to deal with as the symptoms of pain and fatigue affect every aspect of my life. I’m slowly coming to terms with it and learning to enjoy the good days and ride along with bad. Every cloud has a silver lining as I can now spend more time making things, and will share my ideas with you. I have always enjoyed making things and it has been a dream of mine to have my own craft business. Until now I never had the courage to leave full-time employment to follow that dream. I have sold my crafts at fete's, craft fairs and ebay to supplement my income. I love to experiment with different craft ideas, crocheting with wire or painting with glue is just a couple of ideas I came up with. My all time favorite craft is papier mache and I will soon have a whole section dedicated to this fantastic craft. I love creating with any medium and I will be sharing all my craft ideas with you here at Mia's Craft Ideas. This is one of my earliest memories, my sister and I were both preschool. It has stayed with me through the years as it has had a huge effect on my life. It was a really horrible day, hailstones, wind and rain. I grew up on a farm and hated being stuck inside. My sister and I were miserable being cooped up indoors, pestering our mum and getting under her feet, fighting and just generally being typical 'screaming kids'. My mum turned our big kitchen table upside down, we were intrigued. She found two old sheets and tied them to the table legs as sails then she filled the bottom of the table with blankets and a packed lunch. We sailed away from the rain in our home made ship and had some great adventures. This very simple 'ship' kept us occupied for hours and our mum got all her chores done. We went to bed tired and happy, excitedly planning our next adventure. My journey into the world of creative thinking had begun. This was such a simple idea but my sister and I had so much pleasure from our ‘ship’ we actually looked forward to rainy days. Creative thinking doesn’t require degrees or any official training. I did attend Art College but that was many, many years ago. Most of my learning has been through trial and error. Creative thinking is simply using your imagination, children do this naturally without thought. I will help you regain that freshness of your inner child so you too can unlock your creativity. I research, design, create and experiment with lots of different craft ideas. Everything on this website has been made by me unless stated otherwise. Join me as I continue my journey into the world of crafts and creative thinking. You may be wondering how I created this site. With the help of SBI! I now have been able to realize my dream of having a craft business that will pay the bills. If you have any interest in starting an online business then you will have seen all the ads for different platforms that allow you to create a website. And yes, as many of them tell you building a website is easy. It's just a matter of finding a pretty template and adding some content, right? Well yes, that's a website but that's like saying it's easy to climb a mountain. Just put one foot in front of the other until you get to the top. That's all it is in theory, right? I'm sure there are mountaineers and climbers out there shaking there heads at me right now. Sorry, no offence meant, I know there's a lot more to it than that. You need the right training, the right equipment and a great team backing you up. The same goes for building an online presence, having a website is a good start but there's a lot more to it. ~ SBI! is so much more than just a hosting service or website builder. SBI! stands for Solo Build it! It was designed and developed with the solopreneur in mind. SBI! will show you not only how to build a website but how to build a website that actually gets visitors and how to turn those visitors into paying customers. As a solopreneur there's a lot that you have to deal with on your own but with SBI! you are not alone. Just like mountain climbing or any other specialist activity, building an online business requires hard work and commitment. You need the right training, the right equipment and a great team backing you up. You need to know how to drive traffic to your site, to find and use the search terms, known as keywords, that people use to find your content. You need to know how to study your competition so you can be better. You also need to be able to create original high quality content pages that draw your customers in. You have to find you unique view point that sets you apart from the competion and you also have to know how to get those customers to trust you enough to buy your products. That's just for starters. I wanted a platform that was more than just hosting with lots of pretty templates. I wanted a friend that could walk me through every step, show me how to do everything I needed to do in easy bite-sized chunks. I didn't just want a pretty site, I wanted an online business so I could share my love of crafts with others like you. I found that with SBI. All the tools needed to build a successful online business are included in the subscription. SBI! is not a get rich quick scheme, the tools will not work if you don’t read the action guide and work hard. Ken Evoy, the founder of SBI!, has become a trusted friend although I've never met him. He is often in the forums answering questions and listening to our concerns about anything that may affect our businesses. 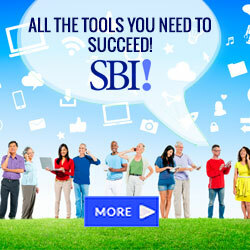 If you are thinking about starting your own e-business have a look at what SBI offers. I have been with them since 2010 and have absolutely no complaints. It costs $299 a year or you can pay monthly at $29. There's a 90 day money back guarantee, so if it doesn't suit you, you can get your money back.The price hasn't changed since I signed up but the tools and help at SBI! are always being added to or improved upon. Watch this space and I will keep you informed of my progress as I build my website business with the help of SBI! Return to top of this about us page where you can choose one of Mia’s craft ideas from the navigation bar on the left. You can Contact Us with any questions or comments about our website.